Home Tags Posts tagged with "Welcome Friends Soup Kitchen"
Elected officials, local leaders and data from nonprofit organizations serving the state, Long Island and Suffolk County seem to agree: Efforts exist to reduce the number of undomiciled residents, but the problem is not going away and more needs to be done. Homelessness has been a topic of conversation in Port Jeff for decades, and Father Frank Pizzarelli, a Port Jeff resident and founder of the nonprofit Hope House Ministries, began addressing the issue in 1980. With 10 facilities, he helps serve groups and people in need. His first endeavor was The Community House in Port Jefferson. A 30-bed long-term facility, the home on Main Street is still in operation today for at-risk 16- to 21-year-old males in need of a place to live. Almost 28 years ago, Pizzarelli said he opened Pax Christi Hospitality Center on Oakland Avenue after a Vietnam veteran froze to death in winter while living in what he described as a cardboard box village in Port Jefferson. At least seven people listed as undomiciled by the county police department were arrested on the morning of Oct. 4 for sleeping in tents in the woods behind the Comsewogue Public Library on Terryville Road, according to police. According to the Long Island Coalition for the Homeless, a nonprofit organization established in 1985 that works with government agencies to secure funding and services for homeless people in Suffolk and Nassau counties, 3,937 people on Long Island were classified as homeless as of January 2017. The number includes people in emergency or transitional housing, as well as those who are completely unsheltered, of which there were 64, according to the group’s annual report for 2017. In context, the number of homeless people living on Long Island hasn’t changed much over the last three LICH yearly tallies. In 2016, New York State Comptroller Tom DiNapoli (D) conducted an audit to examine the issue of homelessness in the state, which reached some discouraging conclusions. “The homeless problem pre-existed Pax Christi,” Pizzarelli said. The licensed social worker said the idea that his facilities attract the homeless to Port Jeff is a common refrain he’s heard cyclically over the years from people like the Facebook poster, though he said he has found those voices are few and far between and don’t represent the majority of the community. 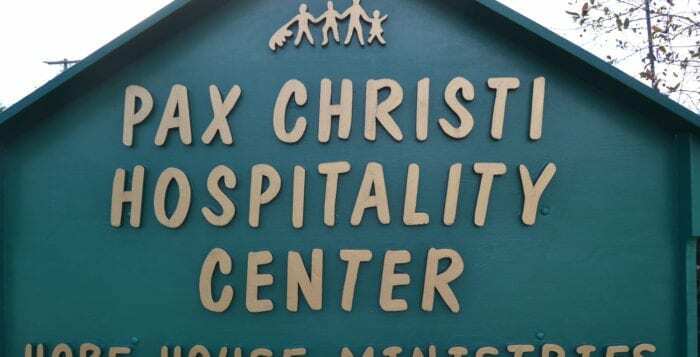 He said he receives no financial support from the government other than reimbursements from the county’s Department of Social Services to barely cover his costs for sheltering people overnight at Pax Christi. His entire budget, which he estimated to be in the ballpark of $5 million annually, is covered by donations and grants. He also said he believes homeless people who commit crimes or contribute to tensions in the Port Jeff community tend not to be the same people who are interested in getting help. Pizzarelli pointed to insufficient funds from the county and state governments as his and other organization’s biggest obstacle in providing services for those in need. He said mental health issues like post-traumatic stress disorder and addiction, especially to opioids, are at the root of Suffolk County’s homelessness problem. Once people are in treatment for substance addiction or any mental health affliction, he said more transitional housing needs to be made available to get people on the road to recovery. Pizzarelli said Pax Christi does not admit any persons under the influence of drugs or alcohol, so they occasionally have to turn people away. DuWayne Gregory (D-Amityville), presiding officer of the Suffolk County Legislature, in conjunction with the Welfare to Work Commission of the Legislature, arranged a public hearing Oct. 10 to discuss the impact that massive cuts in President Donald Trump’s (R) early budget proposals to funding for human services would have on local residents. Michael Stoltz, the executive director of Ronkonkoma-based Association for Mental Health and Wellness said before the hearing he thinks the county fails to adequately invest in mental health services. “We see a proportionate rise and increase in the number of people in our jails who have mental health conditions — untreated and under treated — and among our homeless populations,” he said. Stoltz was representing one of the 13 agencies slated to speak during the hearing. Suffolk and Nassau counties collectively are considered a Continuum of Care community, which is defined as a community with a unified plan to organize and deliver housing services to meet the needs of people who are homeless. Grants from the CoC are funded through the United States Department of Housing and Urban Development, which is a federal department responsible for more than $10 million in CoC grants obtained each year to aid locals, according to its website. DiNapoli’s report found of the smaller communities with CoC programs, Long Island’s counties had the third largest homeless population in the United States. Long Island’s relative lack of affordable housing can further complicate the issue, as housing units are priced to rent or own in Brookhaven Town according to HUD guidelines, which are dependent on the area median income of a region. In 2017, Suffolk County’s average household income was $110,800. To qualify to rent an affordable living space, household income must be less than 50 percent of this number, meaning in Suffolk, any family earning less than $55,400 annually has a right to reduced rent. Monthly rent for a three-person home for a family earning less than that, for example, by law cannot exceed $1,200. Because of the relatively high average income in Suffolk, “affordable” rent is a term that most likely wouldn’t apply to someone sleeping on the street or residing in a homeless shelter. According to Pizzarelli and Brookhaven Housing and Human Services Commissioner Alison Karppi, there’s far less affordable housing available in the town and the county as a whole than demand would dictate. Last week Brookhaven Town announced a new initiative to acquire vacant “zombie” homes and make them available for veterans and first-time homebuyers at reduced costs as a way to expand the availability of affordable housing in the town. Supervisor Ed Romaine (R) estimated there are as many as 2,000 vacant homes in the town with many in a salvageable state. Port Jeff has another resource in its backyard to help those in need, which reiterates Pizzarelli’s sentiment that on the whole, it is a compassionate community. Welcome Friends Soup Kitchen in Port Jeff Village has been serving people in need, homeless or otherwise, in the area for 28 years. The group also has two locations in Port Jefferson Station comprised of about 200 volunteers and functions entirely on donations of money and food, oftentimes from a local Trader Joe’s. Five days a week, the soup kitchen opens its doors to serve as many as 100 guests free of charge each night. Unlike Pax Christi, Welcome Friends never turns away guests due to intoxication. The volunteers prevent entry to those who could be a danger to other guests, but even in those instances the person is sent away with a to-go meal, always well balanced and fresh. Multiple courses are available but served once a day Sunday to Wednesday and also on Friday. Lorraine Kutzing, a longtime coordinator at the soup kitchen, said the organization’s sole focus is having as many meals as possible prepared each day, and hopes that she and others like Pizzarelli can continue to try to fix the problem highlighted by community members like those in the Facebook group.